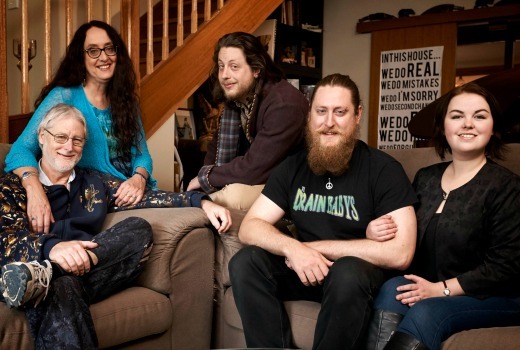 Gogglebox Australia has announced two new households for its third season on LifeStyle and TEN. Joining the series are housemates Zina and Vivian (pictured) above, who say they have a love / hate relationship with Reality TV. Also added are the Sibery family, a house of three generations of women: grandma Emily, 86, her daughter Kerry, 63, and Kerry’s daughter Isabelle, 31. They have an interest in news and current affairs. Exiting the series is the Kidd family from the Blue Mountains (pictured below). Producer David McDonald says they were let go due to their availability. The three generations of women in the The Silbery Family, bring a wealth of life-experiences, personality and opinion every time they sit down to watch the telly together. Great Grandma, Emily “Emmie”, models herself on Judi Dench but is young-at-heart and likes to keep the other ladies of the house on their toes. Mum, Kerry, has a straight-talking no-nonsense attitude to life and is thriving as a middle aged single. Daughter, Isabelle, is a stay-at-home mum who loves politics and current affair but there’s no denying that reality TV is her guilty pleasure. These three women are close and relish each other’s company, but it won’t stop them from playfully pushing each other’s buttons, more often than not. 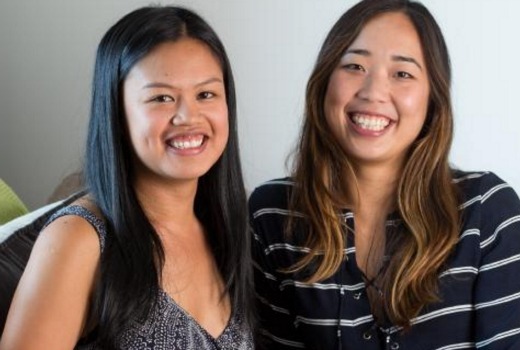 Housemates, Zina & Vivian, are old high school acquaintances who have lived together for almost 3 years. With hectic professional and social lives, these self-proclaimed “reality TV addicts” enjoy nothing more than relaxing in front of the TV together at the end of the day. They have love-hate relationship with shows like The Real Housewives of Melbourne and The Bachelor Australia and love putting their own “judges” hats on for shows like MasterChef Australia, My Kitchen Rules and The Voice. With big personalities and strong opinions, these two are sure to spark some interesting conversations. Returning to Gogglebox this season will be; vivacious friends and housemates, Angie & Yvie: best mates and larrikins with a thirst for life, Adam & Symon: bubbly Greek best friends, Anastasia & Faye: newly-engaged cocktail-loving, Wayne & Tom: the sports-crazy Jackson Family: the fun-loving and cricket-mad, Delpechitra Family: the Indigenous art dealers, Mick & Di: the close-knit, Dalton Family and the happily married for over 30-years couple, Lee & Keith. The Kidd Family has decided to watch less TV this year, and will not be returning to Gogglebox from their lounge room. 8:30pm Thursday, April 7, on TEN. I like the Delpechitra family and are glad they are staying. I think all the houesholds have some good lines. We all have our favourites but I don’t think any group ‘adds nothing’ to the show. The Delpechitra’s were coma inducing in season one but they were much better in the second season. Pleased to see Di & Mick are still about! Love this show. IMO it should have been brought back alongside I’m A Celebrity. It would have provided a great boast for both. I agree, the Dellechitra family don’t seem to offer anything new that the other families haven’t already stated. The Dalton family bores me too. Would rather they left than getting rid of the Kidd family. Why are the Delpechitra Family still on this show? They are soooo boring and even the rest of the family seem embarrased by almost everything the Dad says. Some will say “because it annoys the racists” – but I’ll say it’s because they’re more insightful, thoughtful, and interesting than at least 3 of the others.